Vegetarian and five non-vegetarian barbecue delicacies. Followed by a sumptuous buffet. The day the Turkish nomad discovered the art of grilling, the world changed forever. to seared, chargrilled, tandoored, tossed and sauteed variants. 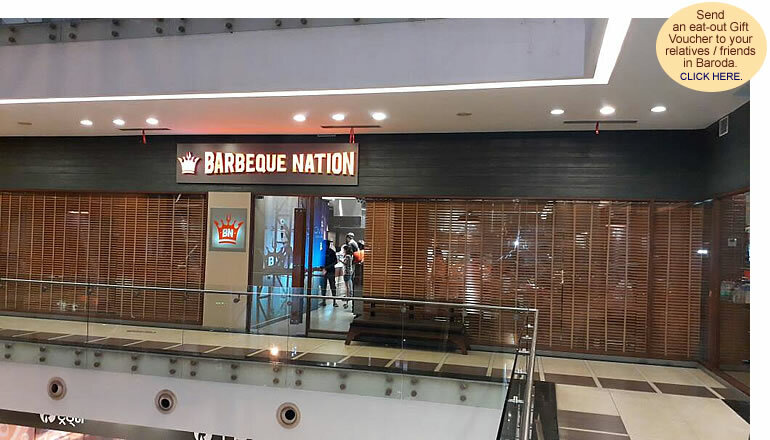 Barbeque Nation invites you to an epicurean tour de force. right on your table. Skewers settle on red hot embers. Baste them with your favorite marinade. Finish them to your preference. Sense the sizzle, soak in the aroma, tuck in the treat. Eat as much as you enjoy. Five vegetarian and five non-vegetarian barbecue delicacies. One mocktail free, and desserts are unlimited. Race Course Road, Vadodara 390 007. 12 noon to 3.00 p.m. 7 p.m. to 11 p.m.